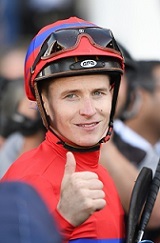 There’s a bullish confidence in jockey James McDonald that outstanding filly Verry Elleegant won’t be beaten in Saturday’s Group 1 $1m Heineken 3 Australian Oaks (2400m). And it’s simply due to the change in Verry Elleegant’s behaviour since the ear muffs were applied. The effect was there for all to see as she raced away with the Group 1 Vinery Stud Stakes (2000m) two weeks ago and McDonald believes the only way is up. “The comparisons are massive, even this morning when I rode her,’’ McDonald said. “Mentally she’s getting better all the time. I can’t believe she turned it around in two weeks. “I still thought if she did things wrong in the Vinery she’d get away with it. It’s clear McDonald is in love with this three-year-old filly. What he’s seen since she switched to Chris Waller at Rosehill is a horse that is blossoming into a complete athlete. “She‘s pretty tough, she doesn’t know how to give in,’’ he said. The last Vinery winner to take out the Oaks was Heavenly Glow in 2008, though last year Unforgotten ran second in the Vinery before going one better at Randwick. McDonald is chasing his second Australian Oaks, having won in 2014 on Rising Romance, and his confidence is echoed in the TAB market that has Verry Elleegant a $1.80 chance. The Punter’s Intelligence data out of her Vinery win showed Verry Elleegant ran just a touch slower (0.08) than Tulloch Stakes winner Angel Of Truth over the 2000m. However, the Tulloch was run at a much slower early tempo with Angel Of Truth’s first 600m run in 40 seconds compared to the Vinery’s 36.77 so the boys were always going to come home faster. Verry Elleegant ran a last 600m of 36.80 while Angel Of Truth, who of course claimed the Australian Derby last weekend, clocked in at 36.18. McDonald said Verry Elleegant does have a small flat spot in her races, more due to her stargazing a little than anything else, and is adamant the 2400m won’t be what beats her on Saturday. “It won’t be a problem. She’s always been a horse that’s been, every time, difficult to pull up and has been brilliant on the line,’’ he said. “She gets a bit lost between the 300m and 100m then seems to find the last 100m. Among an interesting book of rides for McDonald on Day 2 of the Championships is talented but slightly enigmatic colt Zousain in the Group 2 $1m Arrowfield Sprint (1200m). Zousain has been twice narrowly denied in Group 1 races by The Autumn Sun (Golden Rose) and Sunlight (Coolmore Stud Stakes) but the fact remains he’s won two from 11 and has a reputation bigger than his record. But McDonald has seen enough in the colt since he returned after finishing 17th in the Newmarket Handicap to suggest he can regain some of that reputation. “He looked really good this morning, his trial was good too, he has to step up,’’ McDonald said. Zousain warmed up for the Arrowfield with a comfortable win in a 1045m trial at Randwick on March 29 and that was enough to convince McDonald he can bounce back. “It was as good as he’s ever felt and he still had the will to win so that’s the main thing,’’ he said.